Home of the world famous Space Needle as well as the 2014 Super Bowl champs, Seattle is a city that provides endless opportunities for any type of lifestyle. Named the Emerald City for its abundant green forests in the area, the 206 is also occupied by numerous bodies of water. Consisting of 83.9 square miles, Seattle is one of the fastest growing cities in the United States and is home to over 635,000 people. The city is often recognized for being the headquarters of large companies such as Starbucks, Amazon, Nordstrom and Expeditors of Washington. Located between the saltwater Puget Sound to the west and Lake Washington to the east, Seattle typically experiences cool, wet winters with little snow, and warm, fairly dry summers. No matter the season, there are various outdoor recreation activities for people to partake in, such as: hiking, biking, skiing, kayaking, rock climbing, motor boating, sailing, swimming, and team sports. This is a city that greatly values the performing arts as well as education, as it is known for being one of the most literate cities in the United States. While there are public schools within the city, there are a dominate number of private schools as well. Seattle is home to the University of Washington and the city overall has the highest percentage of college and university graduates of any major U.S. city. 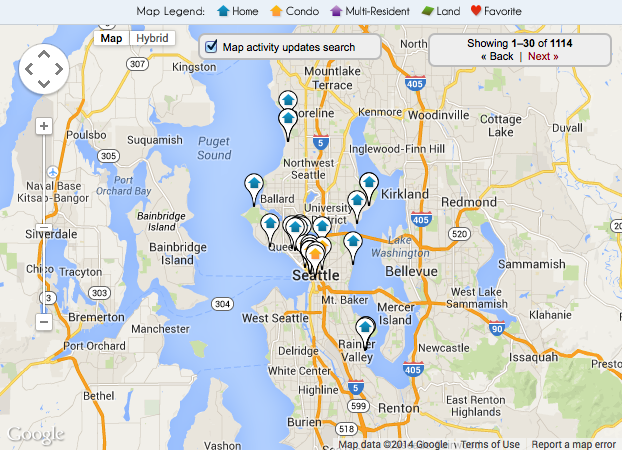 The options are endless when it comes to choosing the right piece of real estate in Seattle. Whether seeking a piece of lakeside property or a condominium high off the ground, there is always something bound to fit the wants and needs of each person interested. Seattle real estate has never ending options for people desiring to live in this bustling city. For those interested in a penthouse in Seattle, be ready to enjoy a spacious home that will allow for breathtaking views of the city’s skyline whether it be day or night. Houses in Seattle tend to sell for anywhere from just under $10,000,000 and go up from there, but the price that is paid will be well worth the cost. Condos in Seattle offer the best of both worlds as they provide amazing views of the numerous landmarks throughout Seattle but also don’t demand personal outdoor upkeep of the spot. No matter the location of a home in Seattle, there is guaranteed to be something exhilarating about the view - and knowing that it can be enjoyed each morning with a freshly printed copy of the Seattle Times tops it all off.